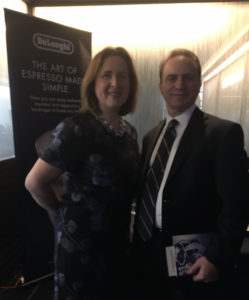 Pictured here are Mike Prager, CEO of De’Longhi USA with Beth Shapiro, Executive Director of NY Citymeals-on-Wheels at the Nov. 16 Annual Citymeals Power Lunch for Women. Each year, a certain number of very special men are also included at this lunch, which is one of Citymeals major fund-raising events on behalf of the elderly homebound New Yorkers that Citymeals serves. Many thanks to Mike and his De’Longhi colleagues. Thanks to them, Power Lunch attendees enjoyed De’Longhi espresso and cappuccino, and had a chance to bid on De’Longhi fully automatic espresso machines. These activities were an extension of “De’Longhi Cares – Day of Volunteering”, which Mike and his team introduced company-wide this year. We are all lucky to have leaders like Mike who show leadership in business and in social welfare.